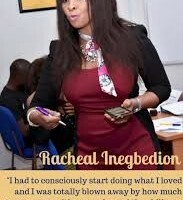 Racheal Inegbedion a social advocate that uses technology, entrepreneurship, mentorship and capacity development to advocate for women, teenagers and Persons with mental and physical challenges. She currently runs a digital technology company known as ARPG Tech that empowers women and teenagers to maximize their productivity in STEM, Education and Business. To continue to feed her passion, she advocates for persons living with disabilities and co-founded a non profit known as Initiative for National Growth Africa where in partnership with skilled professionals, corporate organizations and youth led organizations, she organizes training in entrepreneurship, career development and health outreach for PWD’s, caregivers of disabled homes,management of institutions and foundations,and parents of PWDs. Racheal believes that empowering women, teenagers and people living with disabilities in the African society will increase employable skills and also encourage a strong positioning for them in the society to fight for poverty alleviation for themselves and their families and enable them safe and prosperous.